The theater-goer in conventional dramatic theater says: Yes, I’ve felt that way, too. That’s the way I am. That’s life. That’s the way it will always be. The suffering of this or that person grips me because there is no escape for him. That’s great art — Everything is self-evident. I am made to cry with those who cry, and laugh with those who laugh. But the theater-goer in the epic theater says: I would never have thought that. You can’t do that. That’s very strange, practically unbelievable. That has to stop. The suffering of this or that person grips me because there is an escape for him. That’s great art — nothing is self-evident. I am made to laugh about those who cry, and cry about those who laugh. I am the jongleur. I leap and pirouette, and make you laugh. I make fun of those in power, and I show you how puffed up and conceited are the big shots who go around making wars in which we are the ones who get slaughtered. I reveal them for what they are. I pull out the plug, and… pssss… they deflate. 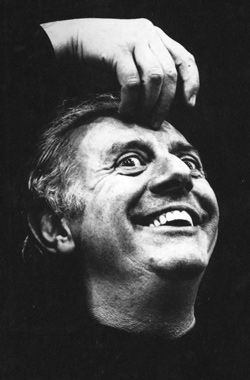 Dario Fo’s theatre was a popular theatre of resistance. For over a half a century, his theatre drank from from the roots of italian popular culture to mock and ridicule the ways of the powerful. In the everyday lives of the people whose labour and creativity sustain the well being of the few, Fo and the different theatre companies with which he worked, found stories of rebellion, of dignity, which could animate different forms of life beyond oppression. And as a storyteller, through his body, gestures, words, through the grotesque and the absurd, he would give life to the stories of rebellion of our time. Fo the buffon worked to unmask the deceit and hypocrisy of the powerful, and as his words would resonate, so would the response of the powerful, with censorship, fines, harrasement and violence. Fo’s writings speak for themselves. His theatrical performances are now moments of the past. Yet how he understood the art of theatre, as a permanent and radical satirical commentary on the present remains as a possibility, a need; a theatre that aspires to make of all of us masters of our own stories. For a full obituary, see The Guardian, Le Monde. This entry was posted in Commentary, News blog, Poiesis and tagged Art and Revolution, Dario Fo. Bookmark the permalink.